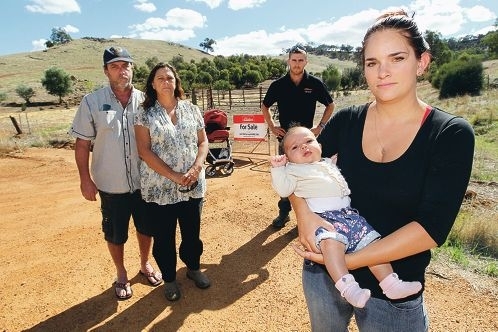 Peter and Carol Moloney, daughter Belinda Springett with baby Hayley and husband Graeme are concerned about the proposal. Neighbour Carol Moloney, who lives a block from the proposed site on Valley View Drive, said she was concerned no one had been told why the men would be receiving respite. ‘We are in an isolated community here; no one can guarantee we will be safe if this proposal goes through,’ she said. Northern Compassion has applied to change the use of the land from a drug rehabilitation clinic, originally advertised in March, to a respite retreat. The first stage of the project would see six to eight in-patients, a caseworker and support worker housed in a nine-bedroom building. Northern Compassion has plans to expand the service to provide for up to 30 men. He said men would voluntarily attend and pay for a 12-week |program. ‘This retreat will provide help for men who have anger management issues or have used drugs,’ he said. Pastor Nicholls said it would not house addicted drug users, as there would be no detox facility. ‘Ultimately, we will help people with life-controlling issues,’ he said. Pastor Nicholls said the program would include individual case management and counselling; lectures and discussion groups; agricultural activities and spiritual development. ‘We will teach Christian morals and values to the men, as well as basic life skills such as cooking, cleaning, time keeping and interview skills,’ he said. The Shire of Chittering recently received 18 public submissions on the retreat proposal, of which 17 opposed the development. Security concerns and the credibility of the organisation running the facility were listed among the major concerns. At a recent meeting, the council resolved to defer the item to enable further public consultation on the proposal.